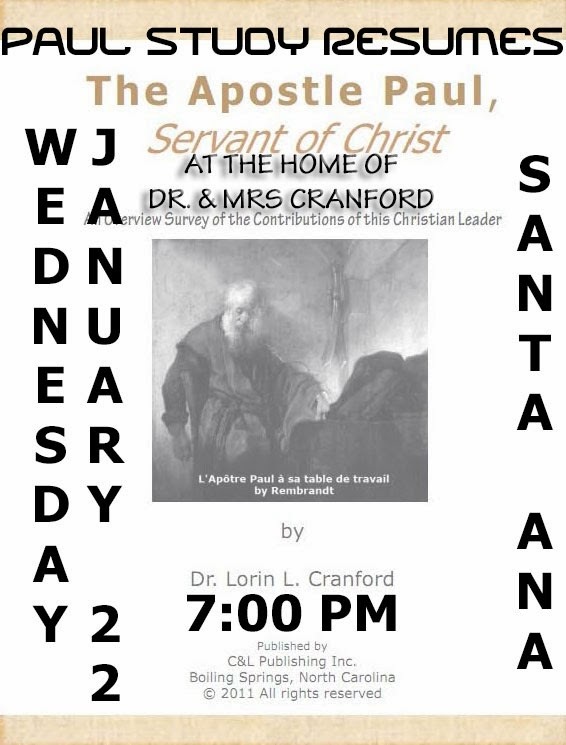 On WEDNESDAY EVENING, January 22, 2014, the study of the life and ministry of the Apostle Paul will resume after taking a holiday break through Christmas and New Years. The study group will continue to meet in our apartment in Santa Ana Centro, apartment 3 across the street from the parking lot of the Pali grocery store. The time will remain 7:00 pm (19:00) as in the past. Study materials are located at THE APOSTLE PAUL: Servant of Christ at cranfordville.com. The first study will be session sixty-one on topic 8.1.2.5.4.2.3 Speech Point One: Paul's Pharisee Life, Acts 26:4-11. We are currently studying Paul's defense speech before the assembled leaders at Caesarea prior to being sent to Rome for trial before Nero, the Roman emperor. This speech in Acts 26 represents one of the finest such speeches in all of ancient literature from a literary perspective. It stands as a marvelous summary of Paul's life and ministry as a Christian. Everyone is welcomed to the study. Bring your Bible expecting to be a part of a lively discussion as we work our way through the biblical texts. The end of 2013 proved to be quite challenging for both Claire and me. Health problems began plaguing us in November and then overwhelmed us in December. Fortunately none were life threatening, but they did have the potential for becoming very serious. The impact was to limit what we could do throughout most of December. For the first time in well over a decade we missed two Sundays of being able to attend church -- the last two Sundays of December. Claire's problems centered around an intestinal blockage and mine were sinus / chest congestion connected to extreme lower back pain that messed up my blood sugar levels from the diabetes. We have slept more during the daytime in the past few weeks than in a long, long time. What we both are extremely grateful for is the excellent medical care that Dr. Maria Rivera, here in Santa Ana, gave us. With her very knowledgeable skills to diagnose our problems, she prescribed both medicine and a series of shots that have turned things around for both of us. Her people skills are just marvelous in a compassionate caring manner for her patients. One morning just before Christmas we had to wait a little extra time before seeing her because she was late getting from church to her office. She is a devout Christian who readily seeks God's help in guiding her treatment of patients. So our immediate goals for January are to completely recover from these nagging health problems. 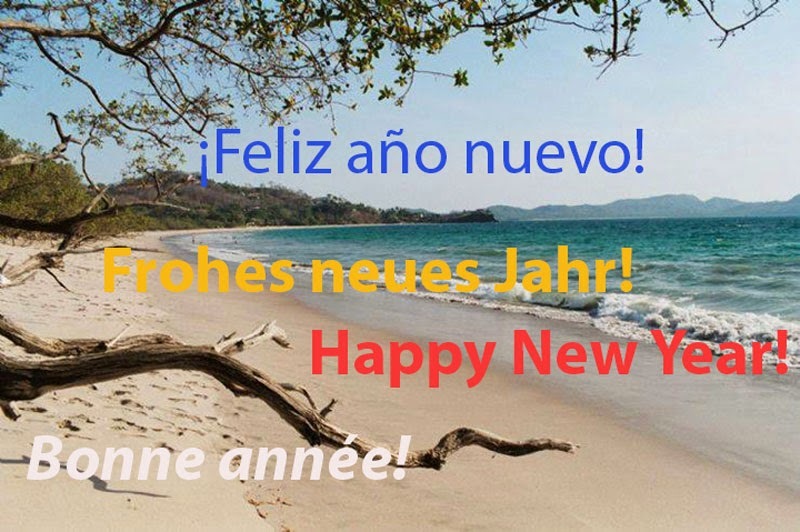 Beyond that we are looking forward to several planned activities during 2014. Claire will resume most of her classes at the city cultural arts center toward the end of January. She will again assist in the English as a second language class, along with her quilting and painting classes. The aerobics exercise class for both of us will also start up again in the middle of January at the city gym. My research and writing will continue on the existing projects, and hopefully I will be able to commence one or two more studies presently in the planning stages. The study on the life of the apostle Paul is approaching 650 pages of background commentary material under the title The Apostle Paul: Servant of Christ. The Wednesday evening Bible study group that meets at our house will resume that study about the middle of January. We have gotten Paul just about through his Caesarea experience and nearly ready for the trip to Rome. Once we finish the history part, then we will survey each of his letters and explore the range of his religious thinking. The Biblical Insights commentary on Revelation is approaching 250 pages and treats the first five chapters of Revelation so far. Although the text of Revelation is challenging, the study is proving to be much more fascinating than I had first anticipated. The Sunday morning Bible study class at our church has been very enthusiastically involved in the discussions. If the Lord tarries long enough before returning, just maybe we will complete this study! The 80 plus page study on the history and impact of Calvinism on Christianity is almost in final form. Presbyterian and Swiss Reform Church friends have provided me with some very helpful critique from an 'insider' perspective by reading the first draft of the study. Within the next few weeks I should be able to incorporate their suggestions into the final draft and then post it at cranfordville.com. On the drawing board in early planning stages is another lengthy study on Music In The Ancient World and its impact on Christian Worship. This study is born of frustration with discovering the utter uselessness of almost all Bible Dictionary articles on this subject. About all one learns from reading these articles is whether the article writer is liturgically oriented or not, since his/her biases become the basis of projecting modern assumptions back into the ancient Biblical texts as though that world used music the same way as the modern world. With a rapidly growing amount of recent research into music and culture in the ancient world especially from Israel and Europe, our current understanding of that world has expanded significantly in the past decade -- way beyond what it has ever been for almost two thousand years. I want to explore this ancient world against the backdrop of how music has been viewed over the centuries of Christian history. This new understanding provides never before opportunities to grasp what went on in the ancient world. Two trips are on schedule for 2014 for Claire and me. In late March we will spend a week in North Carolina visiting friends and family. One major objective will also be to implement the establishment of a charitable trust fund, to be called the Eleos Trust, where our estate ownership will be transferred over now to this trust for distribution to two religious charities after our passing: ABP and IBCM. We are working with legal counsel and financial planners in NC now to get all of the paperwork in place for implementation in March of this year. In July we will once again -- for the sixth consecutive year -- return to Europe for a couple of weeks. First to visit friends in the Bonn / Cologne area, and then to teach again during the summer retreat of the International Baptist Convention at Interlaken, Switzerland. We are really looking forward to this time. So 2014 looks like a promising year of ministry for both of us. We thank God for His allowing us sufficient health to continue to be active in service during our retirement years. Alabamos a nuestro Dios por sus abundantes bendiciones!